LOS ANGELES, 28 July 2014 – SkyTeam, the largest airline alliance in the Asia Pacific region, has launched its new Go Round Asia and South West Pacific Pass, providing customers with a flexible way to explore 26 countries. The latest in SkyTeam’s series of regional travel passes, the Go Round Asia and South West Pacific pass has been designed as a ‘mini-Round the World’ ticket that offers cost savings on flights operated by SkyTeam members serving these regions. Customers wishing to purchase a Go Round Asia and South West Pacific Pass can choose from a minimum of three to a maximum of 11 flights for travel in Economy or Business Class. Fares are calculated within three mileage bands of 13,000, 17,000 and 21,000 miles and travel must begin and end in the same country and at least one stop must be in Australia or New Zealand. Unlike SkyTeam’s other regional travel passes, the Go Round Asia and South West Pacific pass can be purchased without an intercontinental round-trip or Round the World ticket and is valid for travel originating within the region. Plus, travelers can buy a pass as little as three days in advance. Customers can contact their local SkyTeam airline, reservation center or travel agent for details and bookings. For terms and conditions of SkyTeam’s travel passes, click here. Asia – Bangladesh, Cambodia, China, Hong Kong, India, Indonesia, Japan, Kazakhstan, Kyrgyzstan, Malaysia, Maldives, Myanmar, Nepal, Philippines , Russian Federation East of the Urals, Singapore, South Korea, Taiwan, Thailand, Tajikistan, Turkmenistan, Uzbekistan and Vietnam; Southwest Pacific – Australia, Guam, New Zealand. Go Round the World, Go Africa, Go Greater China, Go Europe, Go Mexico, Go Russia and Go USA and Canada. 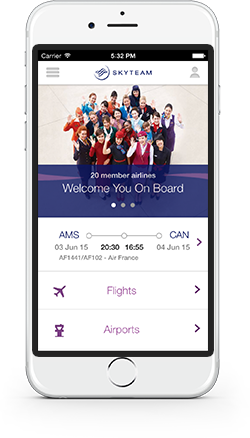 SkyTeam is a global airline alliance providing customers from member airlines access to an extensive global network with more destinations, more frequencies and more connectivity. Passengers can earn and redeem Frequent Flyer Miles throughout the SkyTeam network. SkyTeam member airlines offer customers access to 516 lounges worldwide. The 20 members are: Aeroflot, Aerolíneas Argentinas, Aeroméxico, Air Europa, Air France, Alitalia, China Airlines, China Eastern, China Southern, Czech Airlines, Delta Air Lines, Garuda Indonesia, Kenya Airways, KLM Royal Dutch Airlines, Korean Air, Middle East Airlines, Saudia, TAROM, Vietnam Airlines and Xiamen Airlines. SkyTeam offers its 612 million annual customers over 16,323 daily flights to 1,052 destinations in 177 countries.